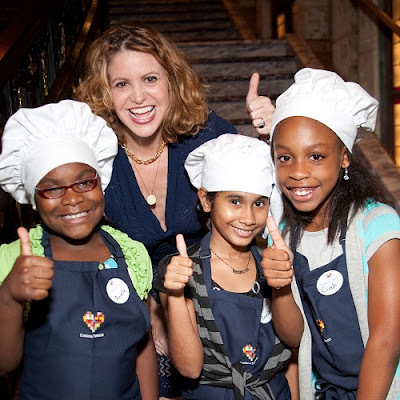 Fatgirl Hedonist: Common Threads: Teaching Miami's Youth How To Cook And Be Healthy! 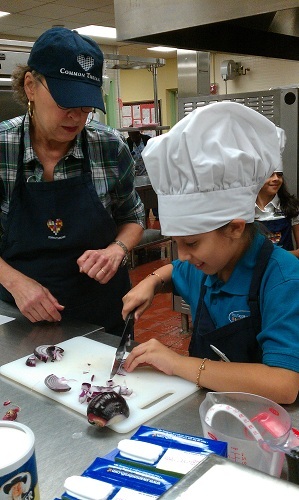 Common Threads: Teaching Miami's Youth How To Cook And Be Healthy! For those of you that follow my hijinks on Twitter, I've been tweeting about and volunteering at Common Threads events for a couple of months now. A question I get consistently asked is, “What is Common Threads? Is it a clothes store?” The answer is “It's not a clothes store!” I decided to sit down with the new Miami Program Manager for Common Thread, Jeanne Necessary, to shed some light on what exactly this amazing non-profit organization is doing in Miami. The mission of Common Threads is to educate children on nutrition and physical well-being, and to foster an appreciation of cultural diversity through cooking classes. Our goal is to teach children about how to make healthy choices, while educating them about the world. We hope this helps them realize that we are all more similar than different from each other, which promotes respect and tolerance of all people. Where did it start and where else through out the country is it available? The organization was founded in Chicago in 2003 by Chef Art Smith, cookbook author and Oprah Winfrey’s former personal chef for 10 years. He founded the organization after cooking for some of the families after the 9/11 tragedy. He realized that there was a need to for people of all backgrounds and races to come together and that food and the table were a great way to do it! Common Threads began with one class in Chicago and has grown to 40 programs across Chicago, Los Angeles, Miami and Washington D.C. Its curricular focus includes after-school, summer camp, parent outreach, and teacher training programs. In 2009, Chef Michelle Bernstein helped to bring the program to Miami. Common Threads started in Miami with a pilot at WJ Bryan Elementary. Since then we have expanded the program to 6 schools in Miami Dade County. We also have classes running in Chicago and Washington DC. How long has Common Threads been in Miami? Common Threads has been providing programming in Miami since 2009. Tell me about the new Miami Dade schools program? 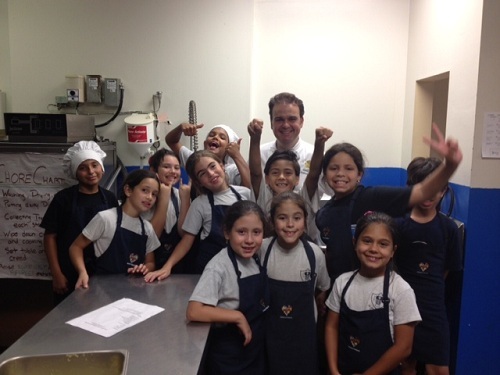 Common Threads has been providing our Cooking Skills and World Cuisine after school cooking classes in Miami since 2009. We’re expanding to 20 schools with our Full Year of Programming that will include the after school Cooking Skills and World Cuisine, Family Cooking classes and in-school nutrition education with our Small Bites and World Garden curriculum. The teachers at the schools have been trained on how to implement our in-school nutrition curriculum which is aligned with the Common Cores Standards. We are focusing this effort on fourth graders. They will have an opportunity to learn about nutrition during the day and connect it in the afternoon during the after school cooking programs. How can children sign up? What schools are you in? The schools send home to parents of students in 3rd to 5th grade to participate in the Cooking Skills in World Cuisine program. The program is offered to the students for free, but they must be on Free and Reduced lunch. We are currently in 6 schools; WJ Bryan Elementary, Morningside Elementary, North Miami Elementary, Mater Academy, Barbara Hawkins Elementary, and St. John the Apostle Catholic School. Can someone recommend a school? People can certainly contact us if they are interested in our programming. We do also provide the classes to students not on the Free and Reduced lunch program for a small fee. Tell me about the other cooking classes you guys have and how can children sign up for that? Is there any criteria for children to become enrolled? For the child to take the class for free they must be on Free and Reduced lunch. Chef Aaron Brooks teaching students at St. John The Apostle. Photo courtesy of Common Threads. How can someone get involved and help? The World Festival is a huge success every year, any other events like that in the works? At this time we don’t have any events planned. World Festival is our largest fund raising event of the year and we hope next year it will be bigger than ever! There you have it folks, Common Threads is an amazing organization helping Miami’s youth learn about being healthy, cultural diversity and physical well being all while participating in fun and interactive cooking classes! This is a neat organization that is fostering and cultivating the art of cooking in a generation that only knows how to microwave their meals. Next time you hear someone mention, “Common Threads,” you’ll know exactly what they’re talking about. Be sure to ‘like’ Common Threads Miami on Facebook!